It's ALL about location! Enjoy your own totally private swimming pool, just 300 yards to the best beach! Unlike properties at Playas Bonita or Coson, NO car is needed as it is a safe 5 minute walk along the beach road to the shops and restaurants in Las Terrenas. You may pay safely with a credit card using PayPal or American guests may mail a personal check. Casa Pura Vida is a romantic 'honeymoon cottage' in a walled, quarter-acre, tropical garden - the perfect alternative to a cramped hotel room. Beautifully yet simply decorated in beach glass colors of turquoise and lime green. Casa Pura Vida was featured on the American television show, House Hunters International on HGTV. Your villa has two bedrooms: each with queen beds, plus twin daybed to sleep five. Comfortable, light-filled living area and dining area. WIFI Internet access is available throughout the property, so you may use your laptop or tablet by the pool! Equipped kitchen, tiled bathroom with HOT shower. High ceilings with ceiling fans and constant breezes. We provide a helpful rental guide and free hurricane refund policy. Our manager will help you with anything you need to make your stay perfect. How to Travel to Las Terrenas: The easiest and cheapest way to reach Las Terrenas is to fly into El Catey airport (Canadian guests) or Santo Domingo--Los Americas Airport (SDQ), hire a rental car (Budget is approx. $240//week) and then make the easy and beautiful 2 hour drive up the brand new highway which starts just outside the airport and travels through palm plantations and rice paddies. Our manager can arrange pick up for you, price depends on which Airport ($80--$180 US), PLUS she can arrange for food or beverages to be at the villa when you arrive! When you make a reservation at Casa Pura Vida, you will receive detailed information on how to travel from SDQ, (or other arrival cities) PLUS you will receive a comprehensive Rental Guide with suggestions for restaurants, nightclubs, where to go, best beaches,etc. Plus: our manager can help you rent a 'quad,' arrange snorkeling, diving or fishing expeditions, zip-line tours... and she can tell you where to find the hottest 'nightclub de jour'! About Las Terrenas: With over 15 miles of deserted, turquoise-water beaches, 'Time' magazine has described Las Terrenas as having one of the last, long stretches of undeveloped beach in the Caribbean. The balmy climate with its ever-present trade winds and the warm temperature of the sub-tropical Atlantic Ocean combine to provide this part of the island with year-round, delightful weather with only a few degrees difference in temperature between winter and summer. Las Terrenas is both a small fishing village AND it is also a vibrant cosmopolitan beachtown with over 60 restaurants, many of which are owned and operated by French or Italian permanent residents and located along the beachfront. There is a modern supermarket, two banks, ATM's, ,exciting night clubs and unique gift stores with quality handicrafts, clothing and jewelry. The French bakery (just a short walk from Casa Pura Vida) is THE place to go for morning coffee and fresh pastries...you will feel like you're in Paris, but with perfect balmy weather! Walk the never-ending beach and watch the colorful kiteboards or take lessons! Go diving, snorkeling, hiking, mountain biking, or horseback riding on the beach. 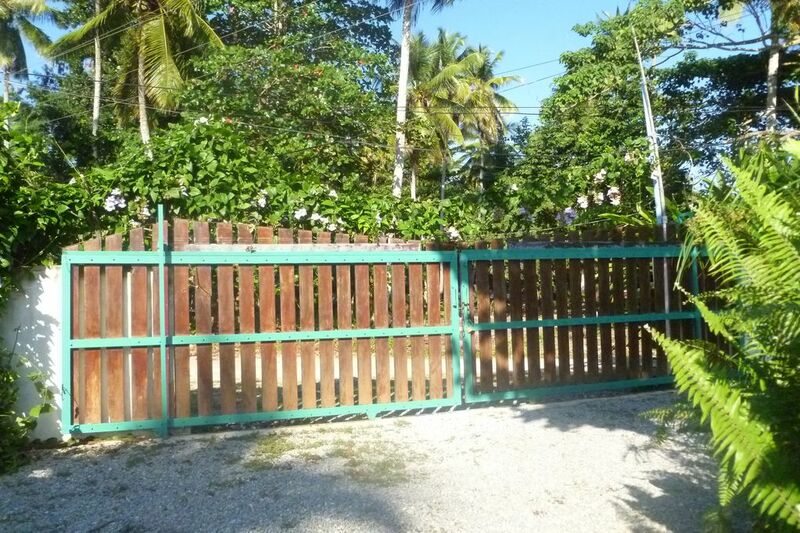 Casa Pura Vida is located in a QUIET neighborhood (no noisy motoconchos!) and is decorated in tropical colors of turquoise and green. Guests may buy fresh fish or shrimp right on the beach and prepare in the equipped kitchen or on the outdoor grill. Purchase freshly-baked baguettes and pastries for breakfast at the French bakery, just a 5 minute walk into town. Take a dip in your private pool and watch the sun set over the hills beyond your backyard. The American television program 'House Hunters International' (on the HGTV network) shot an episode about the Millers and their new vacation home--- the episode has aired several times! After looking at almost every Caribbean island and a couple Central American countries, we bought our villa in Las Terrenas because of its perfect location (we don't want to drive while on vacation :) and because of the wonderful European and Dominican restaurants. Plus, the people in this town are super-friendly and just so interesting. I love being able to enjoy coffee in the morning beside the pool in complete privacy and being able to walk EVERYwhere I want to go! Tiled bathroom with glass brick wall has a wonderful HOT shower. There is also an OUTDOOR shower to rinse off sand when you return from the beach. Many beaches are with walking distance. The closest is Punta Popi and is a quick 3 minute walk from the Villa. Casa Pura Vida is located on a small street that ends at the ocean. From the Villa the sand and water is a 1 minute walk own the street. Just a short 5-10 minute stroll along the beach road to town. Comfortable with a sofa and a daybed. Nice cross breezes. Overlooks the pool. A second dining table is under the romantic Palapa next to the swimming pool. Gorgeous tropical flowers--- cut all you like to decorate the villa! Can be rented for small fee. Please smoke outside-- thank you! The kitchen has a refrigerator-freezer, 4-burner gas stove, microwave oven, coffee maker, blender for frozen drinks, pots and pans, utensils, plates, bowls and glasses: everything you need to prepare all your meals! Barbeque meat and seafood on the backyard charcoal bar-b-q grill. Dine outdoors and enjoy the sunset under the Palapa. A Chef can prepare delicious meals for a small additional charge--just ask Leah to arrange! The Villa has a library of 50+ paperback books for your reading pleasure. You'll never want to move from the shaded and cushioned sofa beside the swimming pool! Walking distance from town. Nice pool. Nightmarish toads at night can keep you from sleeping (not owner’s fault). Major updating needed; i.e., new furniture & beds, new outside lounge chairs & pads, new clean kitchen sink & faucet. There was an attempted robbery during our visit thru a screened back door. They didn’t succeed, & manager didn’t seem concerned. We found a dead toad in the cistern. Good for relaxing & rest. Lovely little house in great location. This sweet little house is in a great location in Las Terrenas; it’s on a quiet street, but within walking distance to everything— less than 5 minutes to the beach and restaurants, 10-15 minutes to the busier part of town. The beaches of Las Terrenas are gorgeous, and you can walk for miles down the beach in either direction. There was hotel construction going on nearby, and roadwork to repair parts of the shore road that had been washed away during the previous hurricane season, but you couldn’t hear any of it from the house, and it didn’t bother us at all. The busy part of Las Terrenas is quite bustling— and loud— at night; but in our private enclave, all we would hear at night were bird calls. Susan was a wonderful host. She greeted us when we arrived, showed us around, even went out to dinner with us. It was like meeting up with an old friend! She gave us lots of restaurant recommendations, set us up on a terrific boat excursion (including snorkeling, a tour of the coastline, and lunch— with lots of good French wine— on a deserted beach), invited us to a fun Trivia Night (Thursday nights at at the One Love Surf Shack in Fishermans’ Village), and introduced us to many local friends. I should probably mention that the small kitchen wasn’t that well-equipped for cooking. It had all the basics, though, and was fine for the little cooking that we did (mainly breakfast and lunch). And there are so many great restaurants in Las Terrenas (many quite cheap and all pretty reasonably priced), that having an excuse to go out to eat was fine with us. Thanks for a wonderful stay, Susan! I hope we meet again! My fiancé and I stayed here for 4 nights this past May. The house was in a great location, easy walk to bars, restaurants and the beaches! The house was clean and spacious, with fresh flowers all around. High powered fans in the rooms kept the nights very cool and comfortable. Backyard and pool space was great to have breakfast and catch early morning sun, or have a late night swim! Can't wait to go back and stay again! This picture says it all. And the house is well laid out - perfect size for 1 or 2 couples. Highly recommend Casa Pura Vida! Perfect location to truly enjoy the ambiance of Las Terrenas. Loved the location and pool! Sweet villa just steps from the beach and quick walk into town. This villa is everything we expected and more. It is safe, comfortable, clean, well equipped , spacious and beautifully decorated. The beaches, restaurants and town are very close. We walked every day. The yard is perfect and lots space to play outside. The chairs at the back are perfect for reading at night and the pool was awesome. We were very lucky to have met the owner Susan. She was always happy to help with anything. She is a very positive woman who always smiles and has the biggest heart. Frito, the property manager was also friendly, helpful and cool. We recommend this villa to anyone who wants an amazing vacation. *** located just 300 yards from Punta Popi: one of the last, long stretches of undeveloped, turquoise-water beach in the Caribbean. ***You can walk to the town of Las Terrenas --no car is needed! Las Terrenas has over 50 French, Italian, German and Dominican restaurants, two large, modern supermarkets, exciting night clubs (dancing on the beach!) and unique gift stores with quality handicrafts, clothing and jewelry. Snorkeling, diving, deep sea fishing, wind surfing and kite boarding are just steps away from Casa Pura Vida. Go hiking, mountain biking, horseback riding on the beach, zip-lining through the jungle, or to the beautiful El Limon waterfall. Other Activities: Kite-boarding (trade winds blow a steady 12-15 mph!) Hobie cats, whale-watching (January-March) zip-line tours and deep-sea fishing. You will receive a comprehensive rental guide with information on all local activities and tips about the BEST restaurants, and MUST-SEE's. Our manager Leah can arrange fishing, diving or snorkeling excursions and quad or jeep rentals. Be careful of rental listings that say 'Close to the Beach,' but require a CAR or TAXI to get there! Rates include electricity, gas and WiFi. Television service available for additional charge.